Sorry, this product is discontinued and stocks are exhausted. Please see alternatives using the category links above. 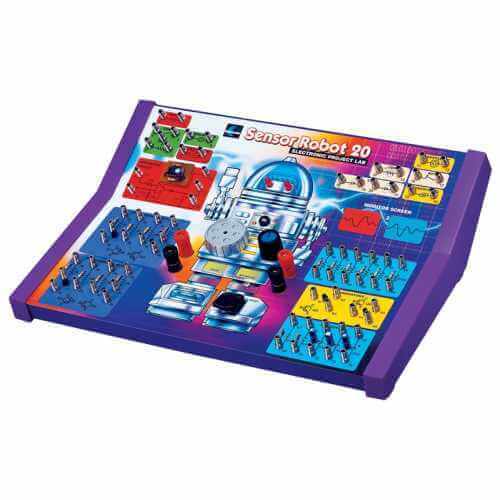 This new Robot Sensor 20 Electronic Projects Lab will start you on the road to a great hobby or career in electronics. It contains all the parts and instructions to build 20 educational and fun experiments and circuits. Explore how a robots sensors work to connect them to the outside world. Components include resistors, capacitors, transistors, LEDs, CdS light sensor cell, Microphone, switches (reed, touch and key push), variable resistor, piezo buzzer, diodes and an integrated circuit. Fully illustrated owners manual provides detailed step-by-step project instructions and is a course in basic electronics in itself!